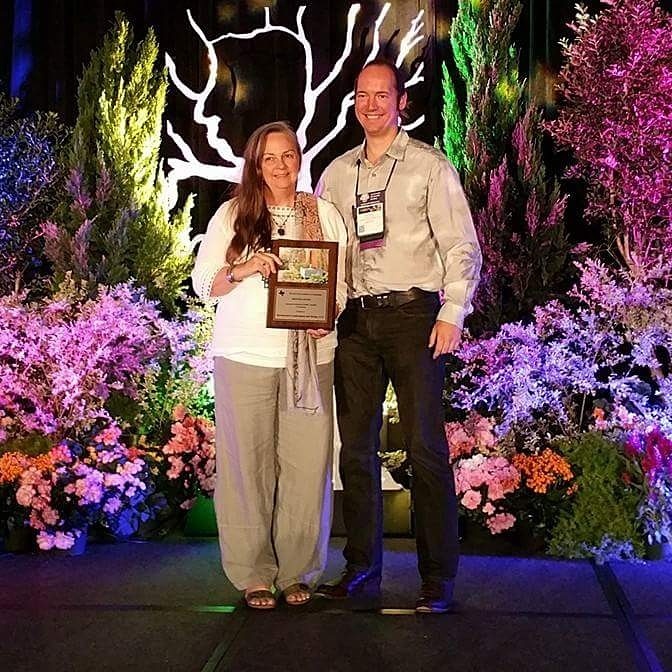 What to do in a shady Right-of-Way with big trees? When we first visited this property the Right-of-Way was bare dirt, a few weeds and a tall oak and pine tree flanking each side. The grass had failed during the drought and now the soil was very hard packed. The side walk was broken and lifting up from large roots of the two big trees. The owners wanted a low maintenance solution that would also be interesting to passers by. Loblolly Pine in Right of Way. 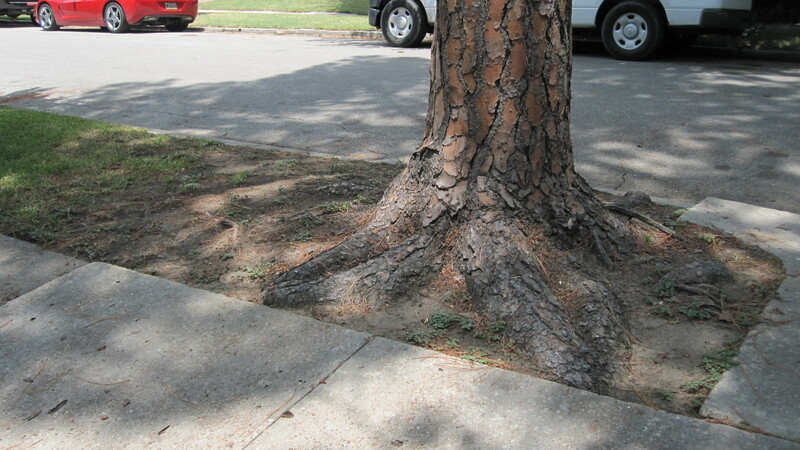 The trees are bound in between the sidewalk and the street. We wanted to make sure they can get as much water and air as possible. We decided to come up with a solution that would not have too many plants to compete for water. The design for the whole property is modern with an Zen twist. The trees led me in a naturalistic direction. 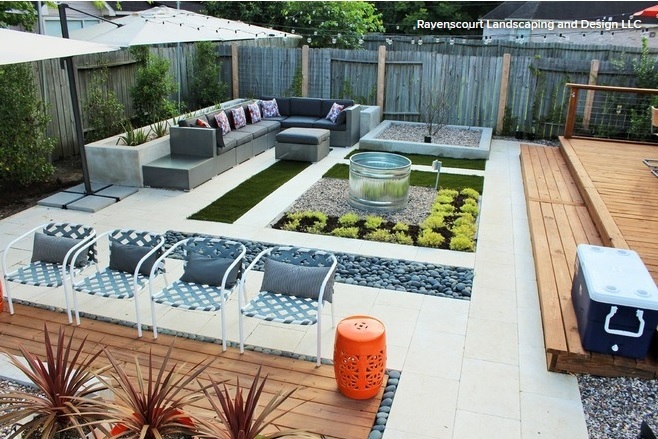 We used mossy boulders, river rock and rainbow gravel to cover the space. We excavated minimally so as to not disturb the roots of the trees. Along the edges (both of the curb and the sidewalk) we excavated more to create a lip to hold our gravel in while providing an ‘invisible’ edge. 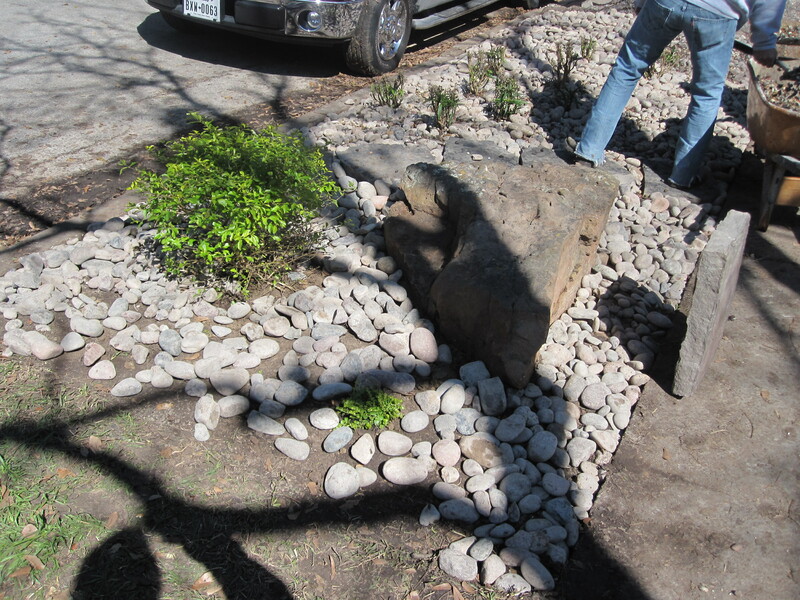 The crew did a great job moving those heavy boulders by hand. 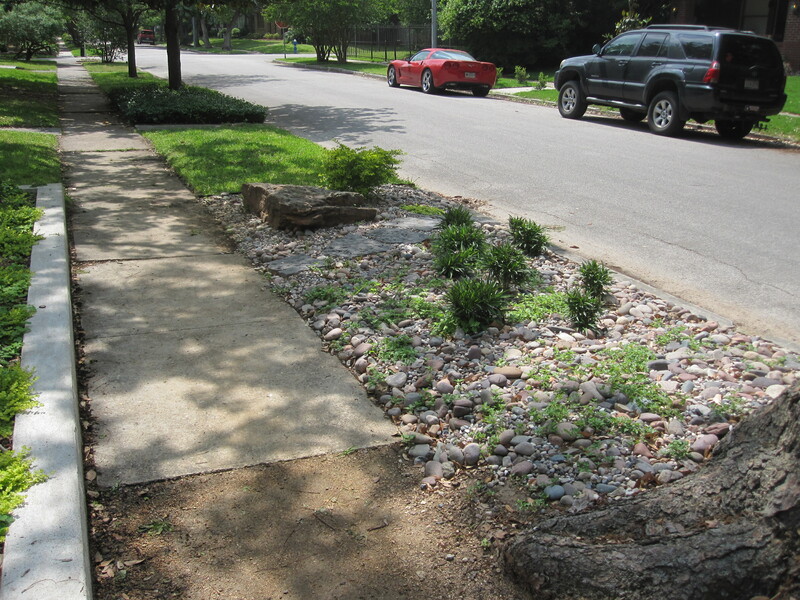 In the area where the old broken and dangerous sidewalk was removed we used decomposed granite as a replacement. It is compacted in and makes for a smooth walking surface. It also allows the water to seep down to be available to the tree. And, if the roots push up again it is easy to refresh. This is neighborhood where people walk and safety is very important. To give some height and visual interest we used various mossy boulders. 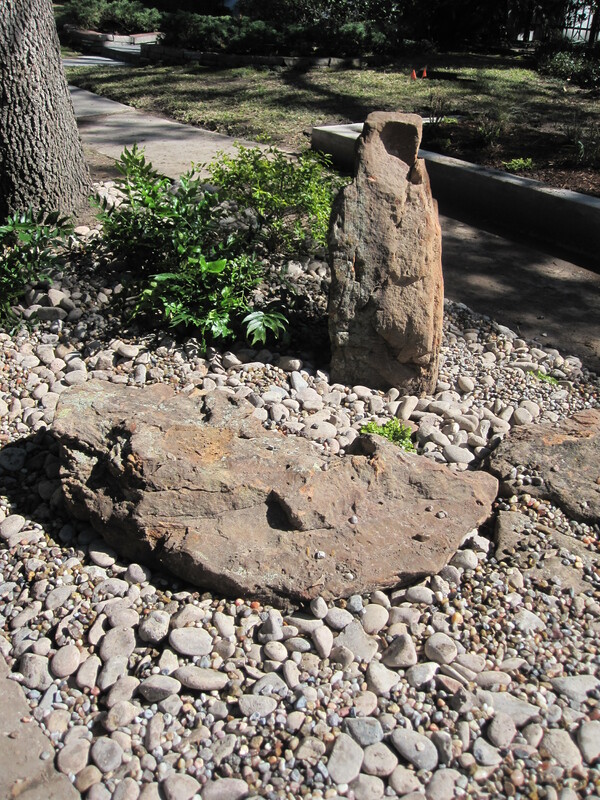 We personally select the boulders for our projects. Mossy boulders (from nearby Ozarks) tend towards being flat/horizontal stones so finding a stone which presents well vertically can be a challenge. We were pleased to find this one. The stones are fun to place/orient; we particularly like sourcing boulders with depressions which cup the rainfall (which leads to more lichen and moss). 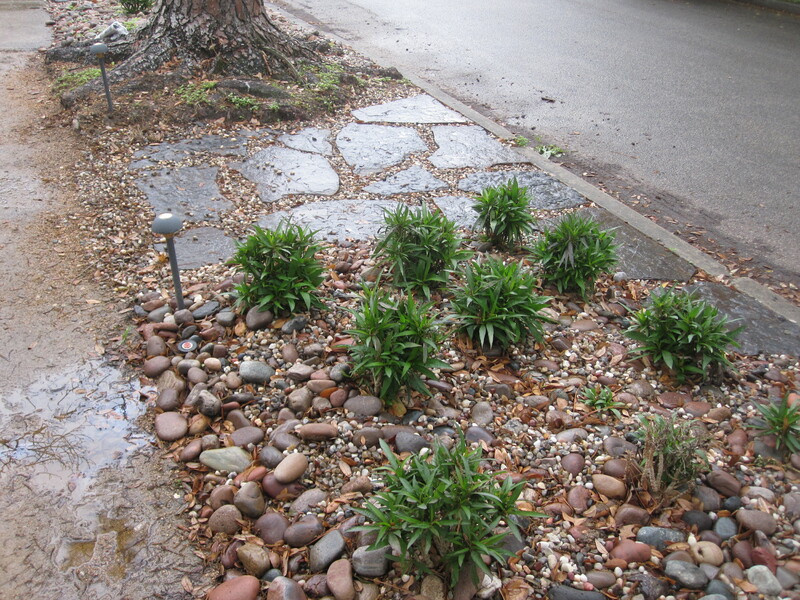 The rocks and boulders make a fun visual treat for people walking by while letting the ground remain totally water permeable so the trees can get as much water as possible. Guests have to park on the street so we wanted to make sure it was easy to negotiate through our rocky right of way with a nice wide flagstone path. 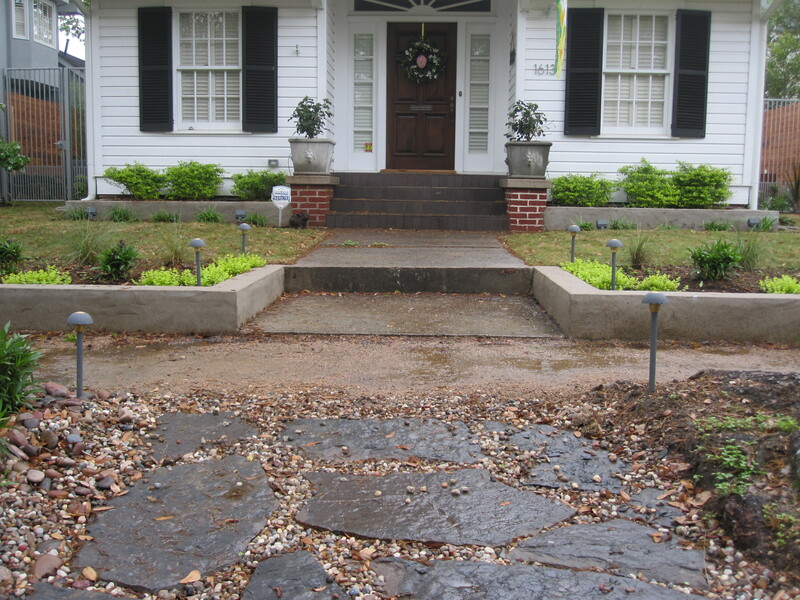 The pre-existing concrete heaved up by the pine tree was an unwelcoming entrance. 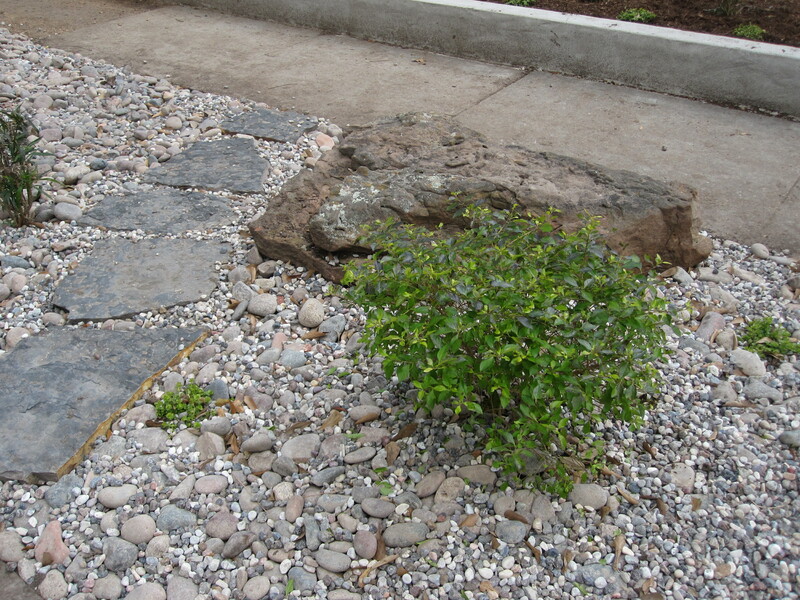 This flagstone, filled as it is with gravel, allows water through while providing reliable footing for guests. Another view, notice the path lights for night time visitors. Another smaller path is at one end for more access. Besides being a practical way to cross the Right-Of-Way this path adds a change of texture. Also, the boulder invites anyone to sit upon it. A smaller path and a boulder large enough to sit on. Small path 2 months later! 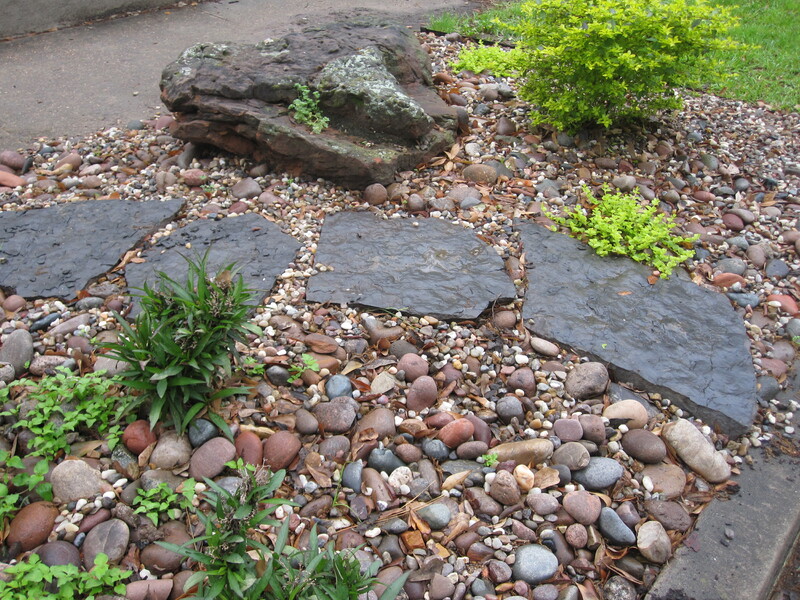 I love the mix of colors in the river rock with the cool blue-gray flagstone contrasted with the shades of green. And if weed grow in they can be controlled with a vinegar solution that works best on a sunny day! Brilliant! I think it looks fantastic. I love it! Rocks can be so beautiful. The vertical stone has a personality to it. 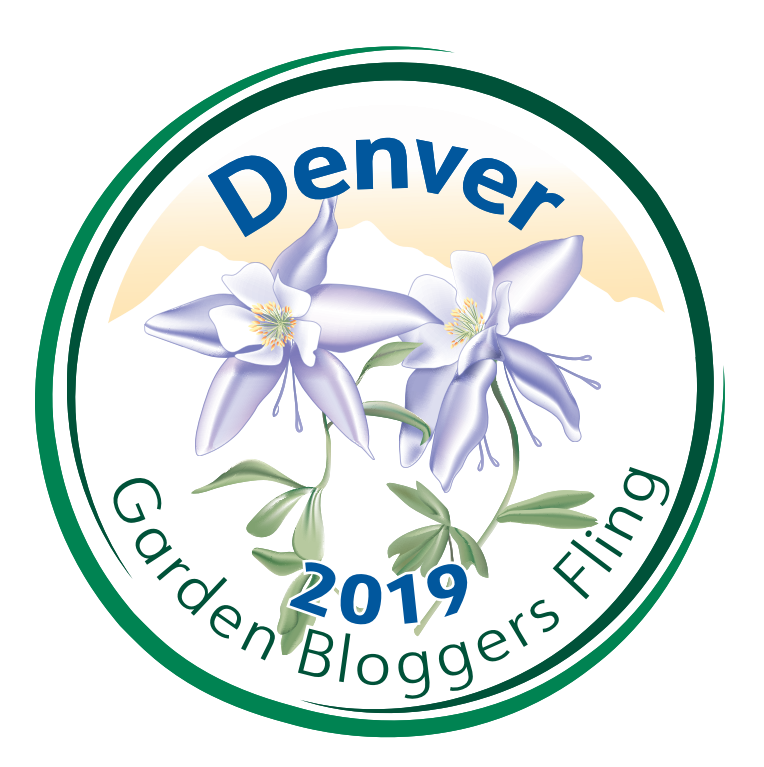 What are the plants in the grouping? Excellent solution. It looks really nice. Fabulous hellstrip makeover, Laurin! I adore sitting rocks; I call them “lizard rocks” because you can stretch out on them and sun yourself like a lizard. Bet the neighbors are really happy you did this. Thank you LL! We did get some nice complements while we were working on the project! We love working with boulders…standing, running, chasing! I have the best lizard rock in from of my own house…check out https://ravenscourtgardens.com/2014/03/12/snowdrops-in-my-garden/ for some cool pictures. 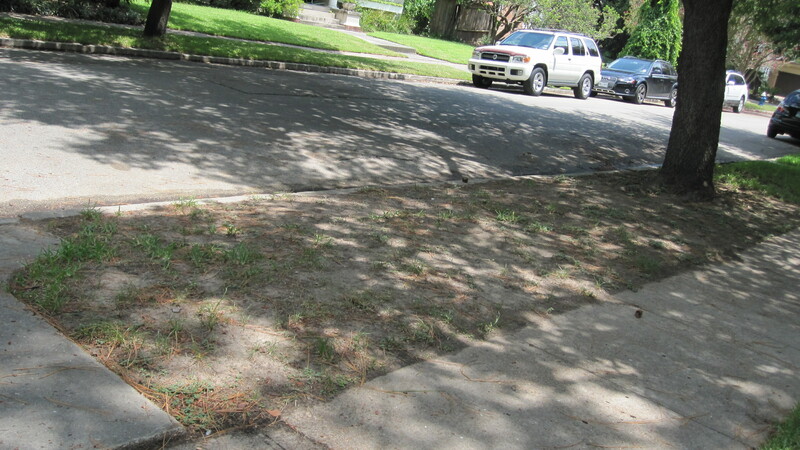 I haven’t got rid of all the lawn yet…but next fall I am planting blue bonnets in the rest of the space. Just took up some of the wee bit of lawn in the inner front garden to put in a citrus orchard.